1. Sam and Gabe are at choir practice with the car. Sam drove. and while I love, love, love that I am not sitting outside the church, alone, in the dark, locked out of the church, waiting for practice to be over so that I can take the boys home... or piddling around the house waiting for me to come get them, I am a tad nervous about him driving home at night. But that is a slight tad! 2. 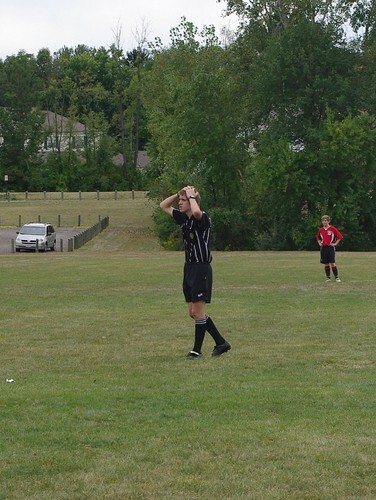 I am a great soccer ref mom! When Calvin was in high school, one year I got him so many soccer games that he made well over $600 in one season. He was absolutely whipped by the end of it but very pleased to have his own money! I have been as aggressive this year with Sam and he appreciates it but sometimes we get some interesting situations. See, when I am looking to get a game for him, I want to make sure that it is in one of the fields that are close to the house, say with 15 to 20 minutes drive time away. I am not willing to drive or to let him use half a tank of gas driving to some lowly little soccer field in the middle of no where. So I am looking at the field location and the date and time. Sam would prefer that I look at who is actually playing! The little kid games, he doesn't mind so much, but he had an 8th grade boys game to ref and I guess it was killer! Fouling, cussing, screaming, lots of running - a young referee's nightmare. I guess I'll have to be more careful about that in the future. I did remind him that the yellow and red cards are his friends and not to be afraid to use them! 3. One of my transcription jobs is going to voice recognition. I will make half the pay per line I make now, but I understand that I will be more productive so it should be a wash. I am at least interested in seeing how it will work. Between this and the competition from off shore medical transcription companies, I will be very fortunate to be able to retire doing this. 4. If I had to change careers, I think I would like Catholic public speaking. I really enjoy my Pre-Cana talks every year. I heard Mark Kurowski say on Catholic Radio that the only way to break into the talk circuit is to write a book first. I could write several but haven't written any! Where to start? 5. Of course my fallback late career could have something to do with this little piece of property my sister and I inherited way up in Michigan. It turns out that if you have a certain percentage in forest and promise to let the land have a natural state, you get a BIG break on your property taxes. So now I'm learning about saplings and soil quality and managing a wood lot. I wonder where all of this could take Mr. Pete and our family? 6. When I was a young adolescent girl, I was vacuuming in the kitchen and day dreaming. I inadvertantly hit the vacuum cleaner on something and pushed the handle into my lower abdomen, sort of like a punch to the stomach. And that was how one of my very first periods started. Long-time readers might remember that last May I fell very hard on some marble stairs and ended up in the emergency room. I got my period later that day but haven't had another one since. I think it is just so funny that that part of my life would begin and end with blunt force trauma! 7. My long-time nemesis has quit blogging. Here's a blast from the past to remember what got that feud going in the first place.